The Birman is a domestic cat breed. Also known as "Sacred Cat of Burma" (particularly so in some languages), it is not to be confused with the Burmese, which is a separate and dissimilar breed. The Birman has a pale coloured body and darker points with deep blue eyes. The Birman cat breed is recognized by the Cat Fanciers' Association (CFA) and by the Canadian Cat Association (CCA). Birmans have semi-long, silky hair, a semi-cobby body and relatively small ears compared to other cat races. In order to comply with breed standards, the Birman's body should be of an eggshell colour or golden, depending on the intensity of the markings colour. The markings can be pure seal, chocolate, blue, red, lilac or cream. Tabby variations are also allowed. Tortie cats can be seal, chocolate, blue or lilac. Birmans have sapphire coloured eyes. The Birman's coat is unusual due to the white 'gloves' on each paw. They are one of the few cat breeds in the colourpoint coat that has fingers and toes in pure white color. The genetics of this feature may not be not fully clear, though a gene conferring the white 'gloves' has been identified. All Birmans are born white (as other colourpoint kittens are) and they start developing their colours at the age of 1 week if they have a dark colour (as seal-point) and at the age of 14 days, or more, if they have a clear colour (as lilac-point). The first part which develops the colour are the points of ears, nose and tail. The real colour is complete at two years old and after a wintry season. Points of Sacred Birman are: Seal-point, Blue-point, Chocolate-point, Lilac-point, Seal Tortie-point, Cream-point, Blue Cream point, Chocolate Tortie point, Lilac Tortie point. The same colours in Tabby version (Lynx): Seal Tabby point, Blue Tabby point, Chocolate Tabby point, Lilac Tabby point, Red Tabby, Cream Tabby point, Tortie Tabby point, Lynx or Red Factor colors on the legs, tail and face. Birmans differ from conventional colour-point cats by their white paws called gloves. The coat is medium-length, not as long and thick as a Persian's, and does not mat. A notable feature is their clear blue eyes, which remain blue throughout their life. Birmans have been bred for their temperament, and companionship, and they form a great affinity with their owner and their family. As all cats, they are highly intelligent creatures, and seem to take a genuine interest in whatever is taking place around them. They are also very inquisitive, and playful, particularly when young, and require plenty of stimulation and attention. The Sacred Cat of Burma is a fine breed cat with a fascinating appearance. Its magnetic look, sweet expression and charming appearance are due to a rigorous standard (description of the Birman) which makes selecting this breed very difficult. Incorrect breeding may easily result in the loss of the sweetness and gentleness of its expression. Parents well adhering to the standard rarely give birth to kittens of the same level, suitable for continuing the cat breed selection. However, the Birman is often chosen as a pet for his loveable temperament. - ghost marks presents also in an adult (except for the tabby variants and the colours red-point and cream-point and red areas of torties). The Bengal is a relatively new hybrid breed of cat, formed by the cross of a domestic feline and an Asian Leopard Cat ("ALC"). Bengal cats have "wild-looking" markings, such as large spots, rosettes, and a light/white belly, and a body structure reminiscent of the Asian Leopard Cat (Prionailurus bengalensis bengalensis). The Bengal cat has a desirable "wild" appearance with a gentle domestic cat temperament, provided it is separated by at least three generations from the original crossing between a domestic feline and an ALC. The name Bengal cat was derived from the taxonomic name of the Asian Leopard Cat (P. b. bengalensis), and not from the unrelated Bengal tiger. Bengal cats have "wild-looking" markings, such as large spots, rosettes, and a light/white belly, and a body structure reminiscent of the Leopard Cat. The Bengal's rosetted spots occur only on the back and sides, with stripes elsewhere. The breed typically also features "mascara" (horizontal striping alongside the eyes), and foreleg striping. The International Cat Association (TICA) recognizes several Bengal colors (brown, seal lynx point, mink, sepia, silver) and patterns (spotted and marbled) for competition. In the New Traits class, other colors may be shown, as well as longhairs. 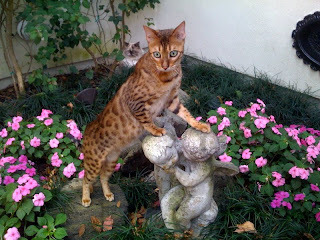 After three generations from the original crossing, the breed usually acquires a gentle domestic cat temperament; however, for the typical pet owner, a Bengal cat kept as a pet should be least four generations (F4) removed from the Leopard Cat. The so-called "foundation cats" from the first three filial generations of breeding (F1-F3) are usually reserved for breeding purposes or the specialty pet home environment.